Residential prices are now 5.6 per cent higher than this time last year. PROPERTY PRICES INCREASED for the eighth month in a row and are now at their highest level for two years. Despite the persistent trend, the 0.6 national increase in November was the smallest such rise since May according to the CSO. In the year to November, property prices at a national level increased by 5.6 per cent. 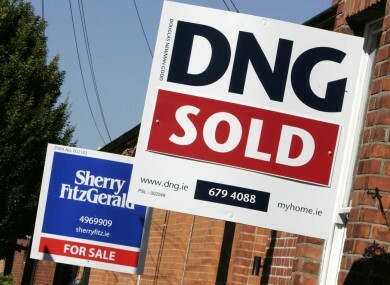 Residential prices in Dublin were up by 1.4 per cent in the month and were 13.8 per cent higher than a year ago. Dublin’s apartment’s have shown even greater recovery and have now grown in value by a fifth since November 2012. Excluding Dublin, property remained unchanged in November but was down by 0.6 per cent on an annual basis. The figures relate to mortgage-driven sales and as such exclude properties being paid for with cash. Dublin prices continue to rebound strongly while prices in the rest of the country remain in the stabilisation phase. Supply remains a major issue in the capital, with new build activity at historically low levels and secondary market transactions only running at about 1.4 per cent of the total housing stock. Since their peak in 2007, house prices in Dublin are 47.5 per cent lower than at their highest level with apartments down Dublin by 56.1 per cent. The fall in the price of residential properties in the Rest of Ireland is somewhat lower at 46.9 per cent. Email “Property prices have increased for the eighth month in a row”. Feedback on “Property prices have increased for the eighth month in a row”.